IPL 2019: CSK wins the toss and opt to bowl. IPL 2019: He is probably the biggest movie star in the nation and when fans got a glimpse of him in the stands at Eden Gardens they could not keep a lid over their emotions. 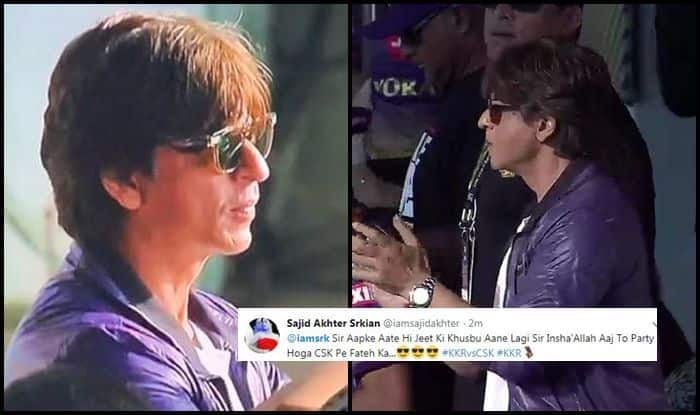 Social media went abuzz with reactions after fans got to spot SRK. He was donning purple jacket which is similar t the KKR colour. The actor has been frequently been visiting venues during this season to root for his franchise. He was earlier spotted in Chepauk when the same sides last met. SRK brings in the entertainment quotient for KKR and has been a supportive owner for over a decade. Meanwhile, Chennai Super Kings skipper M.S. Dhoni won the toss and opted to field first against Kolkata Knight Riders (KKR) in an Indian Premier League game at the Eden Gardens here on Sunday. Table-toppers Chennai, who could be through to the playoffs with one more win, remained unchanged from their last outing which they won against Rajasthan Royals, a match marred by Dhoni’s confrontation with the umpires.